Miguel is an outgoing youth, once he gets to knows you. He does well in school and his favorite subject is math. Miguel typically receives As and Bs on his school work, but he sometimes struggles. Like most typical children his age, he likes to eat pizza, hamburgers, and hot dogs. He also enjoys family get-togethers at the grill. Miguel likes to play video games with his friends and he also likes to build things with Legos. He likes to fish, ride bikes, and stay active in sports. 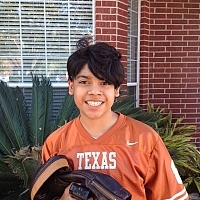 Miguel desires to be adopted by a family that will help him grow. Miguel's family needs to be consistent and structured. They need to have patience with him while he works on improving his behaviors. He will do well in a one or two parent home. Miguel would like his parents to participate in activities with him; especially playing video games (he enjoys winning against the adults).